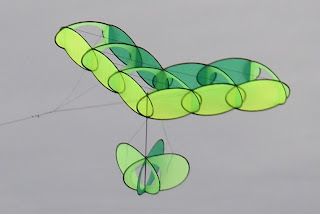 The EO V-plane concept was a test to see a series of planes done in the diagonal rigged cells and test limits, the first V-plane I made in the larger ovals and has the lightest wind performance so far. Unfortunately is a little too large to transport easily by plane, and I developed one out of the smaller ovals, which comes in at 1.6m that is. Shares the same style that has led to some awesome soaring and stable kites that share the EO assembly, and shock-cord clasp convenience.